This post serves to invite you to our AGM / gift packing party on Saturday 8th December, 10am, at 37 Silver Tree Rd, Noorsekloof as well as the last trading day – Monday 10th December, at 1244 Sarah Baartman Avenue. January 2019 will mark the 8th birthday of JBay Recycling Project. We are incredibly grateful to the generous people who allow us to continue to grow and learn alongside the children of Jeffreys Bay. They give us so much joy and hope for the future of our country. So far this year, on around 5,300 visits, the kids traded over 50 tonnes of trash for treasures like balls, teddies, socks, board games, books and blankets, as well as the very basic necessities to allow them dignity: soap, toothpaste, breakfast cereal, pencils, school uniforms, etc. They have diverted 22 tonnes of plastic alone from the landfill whilst learning to earn rewards, count, shop and take pride in their achievements. Thanks to Food Lover’s Market, each child received one or 2 pieces of fruit before leaving the swop shop. Some tasted plums for the first time last summer. The joy of even having a choice between a starking or golden delicious apple is something to behold! At our AGM last year, it was suggested that we try stocking fresh vegetables in the swop shop. We started purchasing R100’s worth of spinach from the Vlakteplaas Permaculture garden and were amazed when, week after week, it would sell out early in the day. Recently we started making up some potatoes, carrots and onions into soup packs. Once again, a total hit! We find it incredible that primary school children are happy to work for fresh veggies – certainly none of our volunteers would have dreamt of spending pocket money on vegetables! The premises we use – the Sunshine Old Age Service Centre – is shared by a retirees’ club, as well as Meals on Wheels. When we occasionally have a quiet day (fewer than 180 kids) we are very fortunate to be able to pass along any perishables to these groups, who appreciate and use them well. Children who are fortunate enough to be assisted by their families often deliver large quantities of plastics, which take time to separate. To save time and enable us to assist more kids, we now require those very big bags to be pre-sorted into 3 types of plastic. We provide smaller “feedbags” for this purpose where necessary. On our website and in local newspapers. We have since welcomed quite a number of new volunteers and received a commitment from CSALT (Christian Surfers Academy for Leadership Training) who have been sending 4 or 5 volunteers every Monday. The YWAM staff and volunteers have been joining us regularly and so have the WESSA staff. A Swiss volunteer, who is a nurse by profession, pointed out to us that teaching the kids to wash their hands is vitally important to their health and that the act is quite foreign to many of our little participants. It is so humbling for us to see examples like that through someone else’s eyes and makes us even more grateful to be able to serve our community. 6 tons of recyclables were collected over 4 Monday afternoons. two-thirds of the children each deliver between 1 and 5kg’s of material – possibly meaning they visit us alone, but likely with a group of siblings or friends. between 5 and 7% of the kids deliver over 21kg – usually this indicates adult assistance. This is welcomed, although adults do not enter the swop shop. as well as 48 rulers. Jeffreys Bay was announced as winner of the Kyknet/Kwela Town of the Year competition and we were very proud that our project was prominently featured and praised by our mayor. The prize included a celebratory festival, held on 21-23 September. The organizers provided a space for our NPO network. This network, called Kouga2Gether, was established a few years ago with the aim of sharing information and resources – informal gatherings are held every few months. This was the first time we collaborated at an event and all embraced the opportunity to take part. Most provided information about their organizations and some sold handmade crafts. Previous exposure we have had on Kwela has led to loads of new swop shops opening all over SA. We were fortunate to be offered the opportunity to showcase our project at the annual JBay Winter Fest between 2 and 17 July. It was decided that we would run an art competition and toy drive. We received over 140 really great pre-loved toys and over beautiful 200 entries to our art competition. Entrants were required to include an environmental pledge, meant to encourage the kids to change their whole families’ habits. Gabriel’s Jewellers donated 3 lovely watches and the winners were stoked! The stall was manned by volunteers; 3 WESSA staff members amongst others. WESSA are very keen to add more of an educational angle to our trading days. Also doing shifts at the stall were 15 female students from the USA, part of http://globalchallenge.org.za/ who very kindly spent weeks manning the stall and finally had the pleasure of experiencing the project when the third term started. On Friday 13th July, six admirable little bicycle owners took part in the East Coast Cycles Village Bike Race. These kids had all saved up enough points by participating in the JBay Recycling Project to “buy” their own bicycles. Bicycles are one of the items in the JBRP swop shop generously funded by the Jeffreys Bay Wind Farm, who invited the kids to participate in this exciting event. There were a few heart-stopping moments, such as when 6 year-old Myrin, who was lying third, had his anorak chord caught up in the bicycle chain. After some help cutting and disentagling he found himself second last, but he was determined to finish which he did. 9 year-old Lindokuhle had a flat tyre, but was quickly offered a loan bike by a well-wisher and also finished his race. The JBay Recycling Project is super proud of these determined youngsters. Jeffreys Bay Primary School deserves a special mention. Each week, our friend Kerry Smith – an English teacher at JBPS, brings 3 to 4 members of the Caring Kids Club to volunteer for an hour at JBay Recycling Project. We all love seeing them walk in the gate and the kids are always very happy to be assisted by their peers. We received visits from a HotSpots2C tour group, who donated wonderful stationery packs. We were visited by Nick Lawson of www.runforlove2018.com – a mad Aussie who is running barefoot from Cape Agulhas to Tunisia! He was overwhelmed by the swop shop concept and has vowed to spread the idea. The Baumgarten family from Germany have been to visit several times and are now busy building a home and planning to move to Jeffreys Bay. Each time, they arrive loaded with donations from friends and family and by their reports now hardly have space for any of their own clothing! Their last delivery of kids sneakers all sold immediately. A teacher from Victory School brought her art class, and they have been tasked to make signs for the different areas of the swop shop. Teacher Lee-Anne Daniels from Pharos school has visited twice with grade 6 class – each time this group of 18 learners spent 2 hours helping us get the swop shop ready for the afternoon by repacking sugar, weetbix, hair bands and marbles. They have promised to return soon! The new management of Harvest Church’s swop shop, at Kleinskool outside PE, visited to check out our organization firsthand. Marianne Venter from Humansdorp, who works at Woodlands Dairy, is all fired up to start a swop shop in that town – about 15km away, which is very exciting. As with all others who ask, we are happy to share all our spreadsheets, systems and sources with her. JBay Academy, another local private school, has given their learners a project which has to involve an environmental organization in their community, so we have been visited by quite a number of these kids. Of course, we encourage them to start volunteering with us on a regular basis. GoSurf Norway donated a carload of children’s clothing and spent a lovely afternoon volunteering. We hope to see them regularly next year. If your family or organization has not been mentioned by name, we apologize and thank you. Of course, the backbone of our organization are the regular volunteers. Too many to mention by name, you know who you are and the difference you are making. Our dear Norwegian friend Terese hosted another hugely successful fundraiser at her son’s school in Tastaveden. We used a portion of these funds to buy loads of onesies – pyjamas being a very sought-after item. We cleared out all the stocks of well-priced onesies in Jeffreys Bay and the kids kept asking for more! The onesies caused near-hysteria and half the township kids are walking around all day dressed as Supergirls, tigers, etc. It’s too cute! Memorably Sino, a 14 year-old boy, came in especially to buy a onesie for his baby sister Aya (5) using his saved Mula. We all made a huge fuss of his generosity, of course. We received a call from our local Pick n Pay informing us that they are donating their Nelson Mandela Day collection of non-perishable food to our project. 119kg’s = 2 trolley loads. 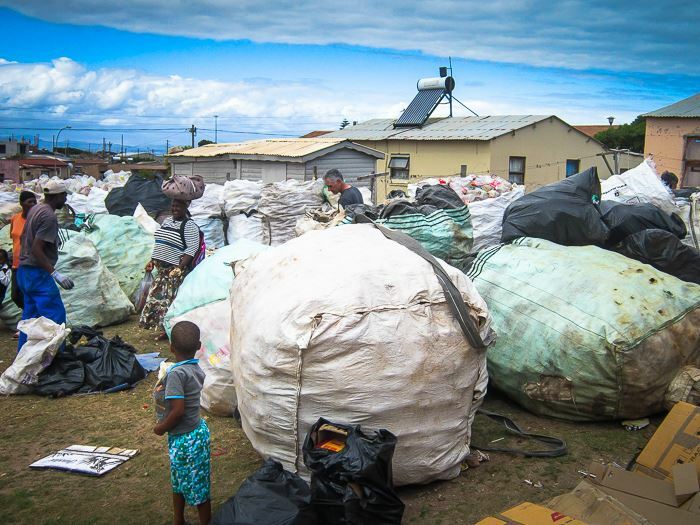 They chose JBay Recycling Project as recipient because they love the work-for-reward model. When Winter finally arrived in August, bringing desperately-needed rain, the very cold nights meant that donated knitted items like blankets and beanies flew out. The project receives breathtakingly beautiful knitting from all over the world, as well as from local Jeffreys Bay knitters, every week. The photos show how happy the kids are to be able to choose a unique, lovingly handmade blanket or beanie to keep them snug. Our annual silent art auction fundraiser was held in September, and better than ever. We received over 100 pieces and our talented organizers Marie and Loretha once again outdid themselves. Infood generously provided the venue free of charge and by all accounts it was the social occasion of the year. Two adult clothing sales were held during the course of the year. Bernie quietly goes about this mammoth task of sorting, marking, storing and collecting clothing and household items and organizing these sales. Very popular with the moms and grannies in the community, these sales raise funds for wool and material to make swop shop stock. The Stretch Foundation, who have been supporting the project since the start of this year, were able to visit Jeffreys Bay in November. What a pleasure to show Nikki and her team where the money is going! They have since confirmed that their support will continue into 2019. On Tuesday the18th September, amidst much excitement and assistance from the community, we took delivery of our very first container. Donated and delivered by Jeffreys Bay SuperSpar and Build-It. We can not thank them enough for this very generous donation. 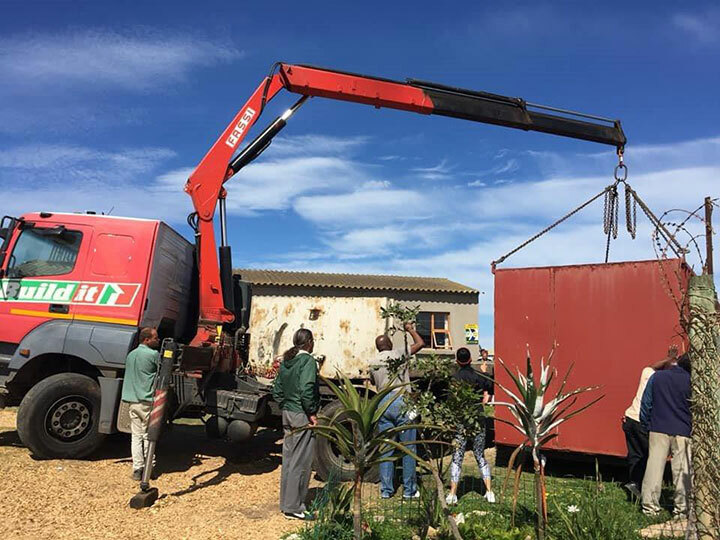 And then on Monday 15th October, a second 2,4 x 6m container was delivered to the JBay Recycling Project – this one sponsored by the Supertubes Surfing Foundation. The SSF h as partnered with the project since it’s 2011 inception, providing hundreds of man-hours every year to sort and pack the 590 tonnes of recyclables collected thus far, transport, funding, logistics and a platform at events. When the request came for a container to be used as storage space for stock, the SSF immediately agreed to source it. It has even been modified according to requests, featuring security grids, and has been painted green! The two organizations focus on very similar goals – those of preserving and protecting the environment by mobilizing the community. We have just completed the building of our stoep to provide some welcome shade in the hot summer months while the children eat their snacks. The children were abuzz with excitement at the new stoep – with the noise levels being testimony to it. 2 x 5000L Water Tanks were also donated to us by the generous fairies of Woodlands Dairy, these will come in very useful in our future efforts at greening the property on which we operate. On our last trading day each year, 300 Christmas gifts are handed to our participants. So far this time, we have been able to gather oil pastels, a colouring book, a small packet of biscuits and a flavoured milk donated by Woodlands Dairy. Celebratory Cake will be provided by Sunbird bakery and InFood always ensure a special treat. Please feel free to contribute 300 of any suitable gift item to make the gifts even more special.